Our top suppliers like Doran Scales, Avery Weigh-Tronix, and Rice Lake Weighing Systems have weighing scales and solutions for all the stages of food production, from farm to fork. We can help you ensure optimum productivity and yield while maintaining quality standards and regulatory compliance. Beverage Production and Packaging - Weighing scales and systems add information and control to your beverage production and packaging operation. Brewery and Winery Scales - Many local beer breweries or winery facilities use tanks to brew their delicious products. A tank mount weighing module kit can increase accuracy and recipe consistency when calibrated to a digital weight indicator. Meanwhile, conveyor scales can increase productivity. Fresh Food - Avery Weigh-Tronix’s weighing scales and systems help the fresh food processing industry maintain productivity and food safety while ensuring regulatory compliance and minimizing food waste. Food Processing and Production Weighing scales and systems help the food processing industry monitor production and minimize waste. Food Waste Weighing scales and systems from can provide accurate weight and tracking information for food waste collectors and processors. Doran FC-6300 Formula Control ScaleWhat would it be like to be in total control? Imagine saving at least 2.1% of your yearly ingredient costs. What would that be worth to you? Doran’s FC6300 Formula Control System puts you in total control and can pay for itself in four months or less. 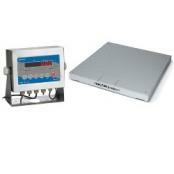 We offer a comprehensive selection of weighing equipment for food production facilities. From weighing grain and feed management to food processing and portioning, our selection of Rice Lake weighing products bring efficiency and accuracy to the food production, quality and compliance table. With several products available for heavy washdown environments which are important in produce, meat and poultry processing, these solutions help manufacturers keep operations within sanitary requirements. SURVIVOR® truck scales are designed for maximum durability and accuracy—two factors essential to grain transfer stations. SURVIVOR’s superior weighbridge design yields from 70,000 to 140,000 pounds Concentrated Load Capacity (CLC) (depending on model), ensuring the strength needed for large-scale grain weighing and processing. The SURVIVOR Grain Dump model is a custom-made truck scale with dump-through grating. The Grain Dump model’s ability to allow incoming trucks to weigh their load, unload the grain through the grating and then refill the truck. All of this happens on the same scale which is quick and efficient to say the least. In a production facility, weighing product throughout operations is a key step to ensuring strict quality and classification compliance. For raw food material handling and processing, Rice Lake’s RoughDeck® HE floor scale weighs food containers on its stainless steel deck specifically designed for corrosion resistance and long life in demanding washdown applications. Its smartly built construction keeps sensitive electronics far from damaging chemicals, moisture and food build-up for dependable, accurate weighing throughout production. For static, heavy washdown and HACCP-required processes, Rice Lake CW-90X over/under checkweigher brings advanced weighing features and efficiency to the production line. The CW-90X offers stainless steel construction and an extra-strength piezo keypad made to withstand sharp knife-point contacts. With an IP69K rating to survive daily sanitary washdowns along with its NSF certification, the CW-90X assures the highest level of compliance and safety in food production weighing. Rice Lake’s broad selection of bench scale models designed to withstand the rigors of frequent moisture contact and industrial cleaning processes are ideal for hostile and washdown food production environments. The BenchMark™ HE bench scale features a stainless steel construction and a stainless steel IP69K hermetically sealed load cell. From ready-to-eat food processing and packaging to market direct-sale counters and everything in between, Rice Lake’s Versa-portion® bench scale offers ultimate versatility for food production. With an IP68 rating and stainless steel construction, the Versa-portion RLP-S is ideal for sanitary environments. 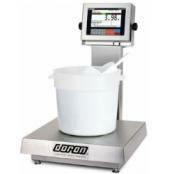 Food labs and high-value food processing applications require precise, sanitary weighing. The sleek, stainless steel housing of Rice Lake’s TS Series balance offers exceptional IP65-rated durability and precision food weighing. 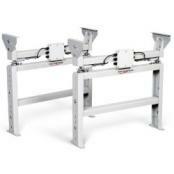 Unique tuning fork technology enables high-speed response time with stable and reliable results. 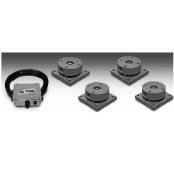 These items provide dependable accuracy, durable longevity, and strict sanitary and washdown compliance. These products help manufacturers enhance operations, meet quality checks and optimize your bottom line.